Well, good for you! Your business is definitely growing. This will be great for scrapbooks and maybe even for making more than one card at a time. I STILL have not been able to get one (limited budget, but I will one of these days! I think you are going to have to explain what a Memory MISTI is. Did I miss something? I see the price point is higher than the regular MISTI so there must be something different about it. Wow - could I ever get a lot of use out of a 12" MISTI!!!! I have the original and the Mini and use them all the time! Was making a Tryfold card just yesterday and wishing I had the bigger MISTI! Hope I am the fortunate winner - I can dream can't I - LOL! Thanks for the chance to win this Memory Misti - question is it different than a regular mini? 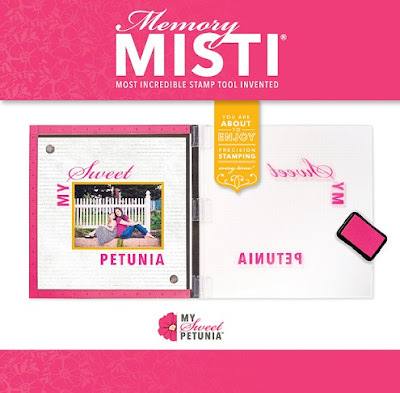 I love the Mini MISTI and the first MISTI so I'm very pleased to see a 12" x 12" Memory MISTI is now available. What a wonderful product it is. Thank you for developing it. Awesome! This is great to have a chance to win Memory Misti! Your card is Beautiful I always appreciate when you post a video! Thank you!! From watching the video it appears this would be a great - and helpful addition to anyone's card/scrapbook tool collection. I love my Misti! Gotta have the mini! Please! Love the card! Know that the MISTI would make life easier and so much better! Wow what exciting news. Congrats on success with all of your wonderful Misti products! I am sure this one will be a huge success also. Have not had the opportunity to try and use your product. Would love to be eligible to win a chance to have one. Whoop, Whoop! Yea for Memory! Love love love the Misti!!! I have the original Misti and keep finding new ways of using it. I don't know how I ever managed without it. A 12 x 12 version sounds awesome! Love your card! The Misti is my all time favorite tool. Now I can make cards with confidence instead of frustration. To think I almost gave up card making until The Misti came along. Love it!! Love your card! Congratulations on the success of the Misti- it looks like a wonderful tool. Thanks for the giveaway and opportunity to win! That's such a good idea for scrapbooking. I would so love to win for my scrapbooking. oh my! so pretty! versatile! Would love to win a Mini Misti! Thank you for opportunity! The memory MISTI is a great idea! This size is definitely the next logical step up from the original MISTI. Hoping to get one this year. I scrapbook alot would love the 12 inch one!!! do you have any videos showing the 12 inch in action?? ?